Dr. Paris uses a variety of options for securing dentures for making teeth look and feel like a more permanent part of your mouth and jaw. Options now exist for securing your dentures to implants to provide increased stability and security. 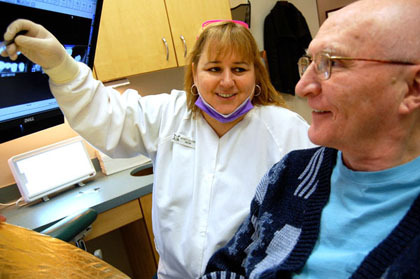 When is it time for a new denture? Over time, tissue and bone shrinks slightly. As this occurs, dentures will not fit as well and will become loose. Denture fit may also change as you lose or gain weight. Dentures can be relined to help them fit better. However, if their bases are too worn, a new set may need to be fabricated. As always, even a full denture wearer should visit the dentist on a regular basis to get an evaluation of the palate, tongue, and surrounding tissue for any problems. Sore spots should not be ignored. Some people have trouble eating and some may have repeated sores, which can be quite painful. We can help with these problems. What is the best way to get used to my new dentures? As with any new appliance, dentures may feel odd at first. They may cause increased saliva flow or they may alter speech. You should start by cutting food into small pieces, avoid hot foods, and avoid hard foods until the tissue (where the denture rests) becomes used to the new teeth. As time goes by, you will become accustomed to them. No – dentures should be cleaned, if possible, after each meal. The best way is to remove them and rinse them. If you are able to, brushing the dentures is advised, as well as rinsing the mouth to clean it of any debris. If some natural teeth do remain, it is important that you brush and floss them thoroughly. Always soak dentures at night after brushing them. Over the counter cleaning agents are available. Keeping the dentures wet protects them from warping. Just like you don’t wear your shoes 24 hours a day, it is also much healthier to keep the teeth out of your mouth overnight to avoid excessive pressure on the soft tissue and bone. Always remember to brush your tongue and lightly brush the gums with a soft toothbrush. Special denture brushes should be used on the dentures. Ask Dr. Paris about options to have an implant inserted to secure your dentures in place and keep them from slipping out at inopportune times.